Prize is not transferable, assignable, or redeemable for cash. No substitution for the prize by the Winner will be allowed. Tablet usability rating: 3/5. No mobile page for Tablet. With 2 open questions, you need to enter personal information. Online. If you want to enter online, beginning April, you can enter via Internet by logging on to the entry site. Visit guest satisfaction survey official website. Enter the access code printed on your survey invitation. Select answer to questions like "How do you purchase your tickets? ",“Did you visit the restroom?”, etc..
Rate your satisfaction with statements like “The picture quality of your movie”, “The sound quality of your movie”, etc based on your visit. Select answers to a few more questions like “Did a team member provide information about how to join the Regal Crown Club?”, etc.. Fill out your contact information like your name, email address, etc.. 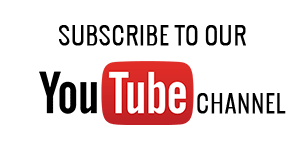 If you have any problem or difficulty to finish Regal online guest satisfaction survey, refer to the following survey video recorded editorial team. 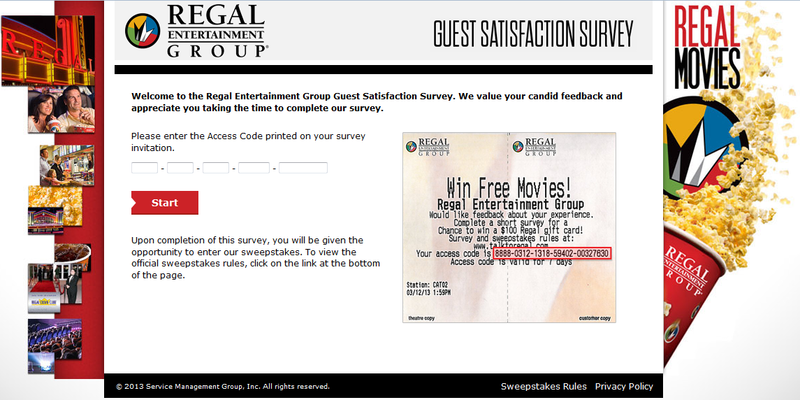 You can also find those related questions and answers related to Regal guest survey in this article. Great place to watch a movie with the family. When my friend and I went to the movie theatre on Monday of this week to see "Miracles" the computer was done so we never received any recognition on our point card and also couldn't use any coupons. I felt like they should of compensated us a discount at the food court or discounted our ticket. Movies were good seat are very comfortable, do need to enforce no cell phones during movie. I didn't pay towatch you IM stupid people to say you were at the movies. i went to see (star wars the force awakens)and it was very good quality and i liked the previews. Excellent place to watch a movie and relax! 1645 1016 1521 56001 00874992 what do I need to do. We were not told about the Survey, although we do at times recieve the free Popcorn, Soda, or movies frequently , After examining our ticket. We were made aware of the Survey. The theater was clean the seats were comfortable the staff were very pleasant. We would not be hesitant in referring others to enjoy movies at Regal Old Mill 10. Bend Oregon. Thank you for keeping the Theater experience enjoyable. The movie theater I was in, was the one showing, War Room, the theater stunk like vomit, the whole theater stunk and was suffocatingly gross which made for a dissatisfying experience. Your theater could use a professional steam cleaning. I really consider sites like this as a waste of time. This is almost a scam. I am willing to take a simple survey, I assume that they will help create a better product. Everything I clicked on just gave me unwanted pop-up ads. We had great seats and a very clean theater to enjoy our show today. Great experience at Regal in Apopka! Theatre is extremely clean, loud enough, large enough, cool enough, and enjoyable to attend. I guess I have to find the inter too win page. I recived a gift card from my son for Regal/Edwards theaters. The closest one is some distance away from our residence. We decided to make the trip to your theater to see American Sniper. It was a movie my wife and I wanted to see. My wife and I are avid move goer's. We arrived at the Regal theater in West Covina at 6:30PM just in time to catch the next showing in 10 minutes. We stood in line and got our popcorn and drinks. All theater concessions are very expensive. We got to our seats , the movie started and we tasted the very expensive popcorn and it tasted like it came out of a bag of popcorn that had been out of a open plastic bag for a week!! It was that stale and mealy. The very expensive drinks tasted very watered down and re-used if that is possible. The theater was very clean and movie was very good. The staff seemed very courteous ad helpfull unaware that the food the were selling was sub-standard at best. If you visit a Regal/Edwards theater remember to taste you food/drinks before leaving the counter. If Regal/Edwards corporation is reading this , I hope you will take notice of this oversight and fix it. When we made the long trip to the Regal theater it cost us over fifty dollars. It is a trip we will not likely make again due to the sub-standard consession food we received on our first visit. I hope you will change my opinion of your establishment and we can re-visit your great theater complex. Just viewed a powerful movie. American Sniper shown at the Gainesville Regal at 1:05 p.m. Tuesday, January 27, 2015. Even though the movie has been out for over a week, the theater was full. My comment has to do with the ushers. It would have been beneficial to movie goers that were trying to find seats for the ushers to help them. The only time we saw an usher was when one walked through the theater briefly during the middle of the movie. I enjoyed the movie and the people at Regals were great. I am writing to express our dissatisfaction with your recent decision to charge us an extra $1.00 per person to see films in Southern CA. We were shocked that you and your Regal theatre would pull this crap on us. We purchase our tickets from Costco and, up until last night, have enjoyed ourselves at your Regal theatres. After last night we have returned our unused tickets to Costco and purchased tickets for the nearby AMC theatres. I will also be canceling my long time Regal Crown Club membership # 2473299 and we will begin having numerous discussion with our families, friends and acquaintances about your current values. This website is confusing. Makes you not want to take the survey. Enjoy going to the Paladium-shuch such great movies!!! I agree, site is confusing, too much stuff here. I don't mind taking the Regal Survey but where is it? I've clicked on several arrows and gone to sites having absolutely nothing to do with Regal! I'm done now, thank-you! movie I saw was America its the second time I view this documentary..I would go see it again if I had a chance. Basic information expanded upon that gives a very good idea of where we were once where we are going now with all the corruption inbetween and the present corruption and how that all came about thru or past first lady Hillary Clinton and the current President how he too was once taught by these ganster mobs...Is it any wonder his ideas are so darn unpatriotic. We certainly need to do our homework as to who is running for any office these days. Certainly a background check is in order and not one that is tailored to cheat and lie right and left. Exposed for what they don't do was very well put with enough truths that they should really head for another place on the map. Personal opinion see where we are all enslaved weather we want to believe it or not its so. This website is too confusing. I was just trying to complete your Regal Entertainment Group survey for a chance to win $100. Too much stuff on this page that is UNCLEAR. Not just one clearly marked place to enter for the "Regal Survey" and a clearly marked block to enter the "code". In driving distance from my house, there is no theater around that is even close! I watched Lucy, and it was just so amazing!!! I had never watched a movie in a theater in my life!!! It was a breath-taking experience for me. By the way, I highly recommend watching the movie "Lucy". Your people are always very helpful and friendly.